If only I had known about Heidi’s Hummus Hack! I would’ve gotten a lot more sleep. I did and I agreed with her, though part of me thought that maybe Heidi brought it from Brooklyn. It was that good. Not really, she said. But she did fold a few big scoops of full-fat plain Greek yogurt into a store-bought version from Whole Foods. Did that count? Ummm, yeah it counted. I had never heard of this trick, had you? (Though it did give me a flashback to the days I edited the “Fake It Don’t Make It” column in Real Simple.) Heidi told me she thinks she originally got the idea from Ottolenghi or Nigella, but has been hacking her hummus for quite a while now, usually starting with Whole Foods’ store brand plain hummus (none of those weird flavored numbers) because it had the right amount of lemon. The addition of yogurt gave it a subtle tang, but mostly it was about the texture. It’s crazy how much more appealing it looked than your average plastic-sealed supermarket variety. Inspired, the next morning I picked up a container of Trader Joe’s “Smooth and Creamy Classic Hummus” along with a seven-ounce 2% Fage plain Greek yogurt. (My TJs didn’t have full fat version.) I scraped the hummus into a mixing bowl, then folded in a large tablespoon of yogurt at a time — sorta like folding in egg whites into a batter — until it reached the same luscious consistency of Heidi’s. (In total I used about three heaping tablespoons.) I decanted the whole thing into a little serving bowl, topped with olive oil, tiny bit of sea salt, some paprika, then watched as both kids attacked the stuff with pita chips. Definitely a keeper. 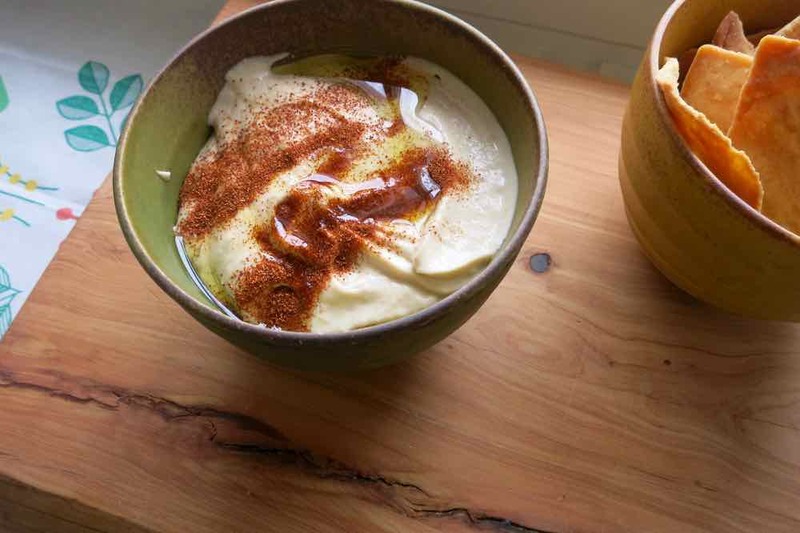 Related: Homemade hummus; Related, Part 2: How to turn hummus into a two-minute dinner. This makes me think that a nondairy, slightly more authentic hummus hack would be folding in extra tahini. I just got Zahav for Christmas, and he explains that the secret to good, Israeli hummus, is about half chickpeas half tahini. I always guessed that store bought varieties skimped on the tahini, given its expensive nature, to cut corners and that’s what resulted in the paste like quality. I’m going to try this immediately! That’s interesting– half tahini is a lot of tahini! I have always felt that what went wrong with my homemade hummus was that it’s really hard to find tahini in a jar (where I am) that doesn’t taste slightly rancid. 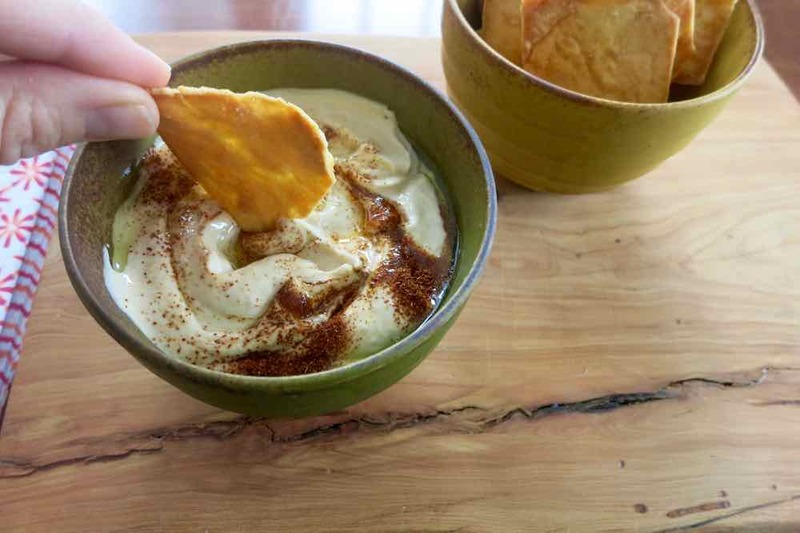 It’s a Nigella hack — one from her recipe for hummus made from dried, soaked chickpeas. It DOES make amazing hummus! I had never thought about adding it to storebought, though — genius. Good Middle Eastern food is what I miss most about living where I do. Portland, Maine, has many fine places to eat and I am truly spoiled … but if only we had just *one* grocery store with hummus and tzadiki in tubs, tons of big bags of spices, and fresh pita for sale! There are a couple Middle Eastern grocery stores on Forest Ave, towards the clock tower. One of them even advertises that it sells shawarma. However, I haven’t peeked in myself. Have you tried the food truck C.N. Shawarma? Usually hangs out by Rising Tide in the winter. Really good falafel and shawarma wraps. If you’re ever in Boston (where I used to live), you HAVE to go to Garlic N Lemons on Harvard Ave. The spicy chicken wrap with everything (including garlic sauce) is THE BEST. Chubby Chickpea (food truck and maybe a B&M by now?) is decent too, and Clover (B&M’s and trucks) has decent falafel too although their fried Brussels sprout sammie is my fave menu item. I remember Nigella talking about ‘zhuzhing up bought hummus with Greek yogurt’ on her very first series of cookery programmes Nigella Bites around 2000.
i agree that full-fat Greek yogurt makes everything more delicious, but homemade hummus is really easy, especially if you have a Vitamix (which we longtime readers know you do!). I use the recipe from The Best Recipe — chickpeas, tahini, garlic, lemon juice, cayenne, olive oil and (the secret ingredient) water. Takes about 5 minutes. Moved to Charlotte, NC almost four years ago (from Brooklyn) and still dream of Sahadi’s. After eating hummus in Israel and then making it from scratch (from my Israeli mom’s recipe), store-bought hummus is just NOT an option. I’m happy to have this hack, though, for when homemade just isn’t possible (and for when I move to the ‘burbs!). I love your daughter’s description of “aftertaste-y”! I know exactly what she means. Perfect! I love Smitten Kitchen’s recipe for homemade hummus. Getting the jackets off the chickpeas is tedious but totally worth it in the end product. And let’s not forget bumped up protein content. Love picking up ideas like that, thank you for writing about it! Boy, I would love a pint of hummus and a pint of baba ghanoush from Sahadi right now. My latest hummus hack is to cook canned chickpeas in their liquid with a teaspoon of baking soda till they’re nearly falling apart, and then proceed with a modified version of the Cook’s Illustrated recipe. This makes the hummus much, much smoother. If you try it, eliminate any extra liquid you can (sub lemon zest for some of the juice maybe). This is GENIUS! I will be testing it out this weekend – can’t wait. Okay, I’ll admit that I was *very* skeptical when I first read this. I figured the yogurt flavor would be obvious since I can always tell when I’ve swapped Greek yogurt for mayo or sour cream. I decided to try it anyway, since we were making Smitten’s baked chickpeas for dinner. WOW!!!!!!!!!!!!!!!!!!!!!!!!!!!!! Seriously could not believe how good this is. It’s delicious even without the toppings (we made more this morning, since every little bit of it got devoured last night). I will never, ever, ever go back to straight from the tub. Thank you so much for sharing!!! Well that’s brilliant. I make my own hummus when I want it (I use Ottolenghi’s technique, though not his proportions), but my husband could live off of the stuff and so we always have the store bought on hand. I’m trying this hack as soon as I’m done typing this comment. another hummus hack that i love is adding in a jar of pickled brinjal. it is amazing. This is a much needed hack!! After a trip to the Middle East last year I haven’t been able to stand the texture of store bought varieties and have struggled to replicate traditional recipes without fresh chickpeas. I can’t wait to try this for a dinner party this weekend! YAy! I love making hummus so much. It put it on everything from sandwiches, to pizza, to eggs, even on top of pasta sometimes, its really my favorite thing. I recently tried making a sweet hummus to put on top of fruits, I used white beans, coconut oil, some honey and 1 teaspoon of this chai spice blend I orderd on etsy, it was a huge hit! My kids have been asking for it for dessert overnight!! Love this hack! I’ve done it twice since I’ve read this! Yum!! That is taking something already healthy and making it double so. Don’t know if I am brave enough to give it a try. But I think I will. Ugh! As a non dairy eater, this is horrifying. Normally I can look at hummus and not wonder if anything that came out of a cow is lurking in it. Now I am suspicious of what is normally a “safe” food. Repulsive. Wtf.